Two churches near Plough Road are currently either with plans approved for demolition or with a proposal to refurbishment. The full detail of application 2013/2619 says: Internal and external alterations to St Paul Church including the insertion of rooflights, inverted dormers, a glazed canopy and new entrance and creation of new mezzanine levels and excavation to enlarge basement in connection with the use of the ground floor and basement for community facilities (use class D1) and the upper floors as four residential units (C3); demolition of the existing church hall and erection of a two-storey plus basement house. The whole church is derelict and needs repair. The ground floor and mezzanine in the church has been used in recent years as a community centre for the neighbouring school. We could say that, at last, something is to be done to restore the external appearance of the church. Removal of the ghastly wire-mesh protection frames around the lower windows, matching any new entrance doors and new windows, new original-design railings, etc. The inside is unrecognisable as a church any longer, so conversion to housing above community use ground and basement seems likely to be an improvement. The church hall in the courtyard has remained redundant and dilapidated. Although St Paul Church and the adjoining school are Grade II listed buildings St Paul Church is in the borough listed buildings list and the adjoining school is Grade II listed building (92 St John’s Hill), the church hall is of no particular interest, set-back from the street and in an awful state (the lack of maintenance – fallen roof with holes, crumbling walls – means that the building has fallen into a state of disrepair). In those conditions, it seems appropriate to destroy the building and replace that small part into a more modern but still considerate block. present, this does not seem an out-bearing feature (and apparently neighbours seek more reassurance on their concerns regarding their privacy, than a total objection). Similarly the fear of people sitting on the small part of top flat roof on the new building and enjoying the sun does seem very unlikely to us and not critical enough to refuse the planning permission. All in all we are happy with the proposal and would like to support it. Everyone can comment on the scheme until July 16th. St Paul church was used once to be a temporary Church called St John’s. Then in 1869 it became St Peter & St Paul designed by H.E.Coe. He designed three other unremarkable churches (in Pevsner’s eyes) in South London, St. Andrew, Stockwell (he ‘remodelled’ a 1767 church), St. Philip, Kennington Road (demolished) and All Saints, Camberwell. However, he was much better known as the architect of the two exhibition halls behind the façade of Olympia and co-designing the Agricultural Hall. In the 1950s Chad Varah was a Vicar at the church – he went on to found The Samaritans, undeniably laudable, and was involved with Marcus Morris in setting up The Eagle, less worthy, but nonetheless important to those of us of a certain age. The church itself is a beautiful building: quite small as churches go, elegant spire, externally simple design, attractive stone construction. A real visual asset to St John’s Hill. Demolition of all existing buildings on the site. 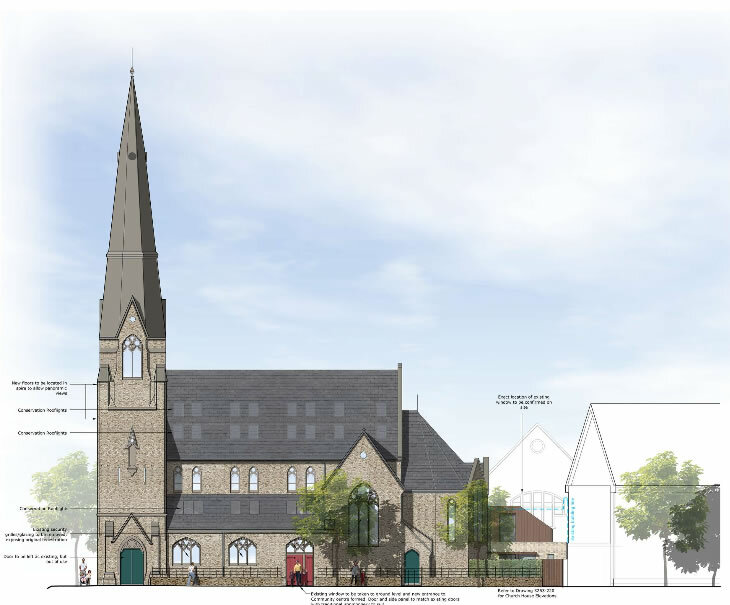 Erection of new church and community building and 69 residential units (including a new vicarage) in buildings up to eight-storeys high; basement car park for 56 vehicles accessed off Plough Road. 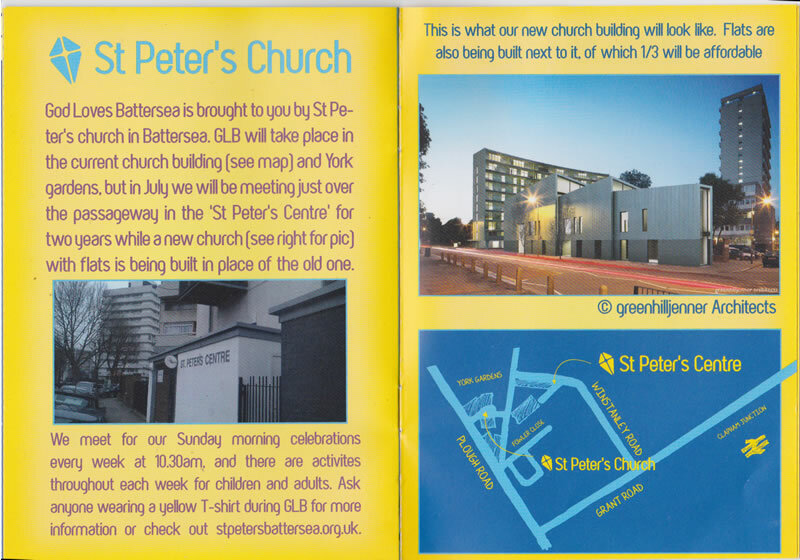 However, as some of our members have received a leaflet with the new building layout in the recent months, I would like to take the opportunity to highlight the case. The Wandsworth Society (the Battersea Society and English Heritage were also against the proposal) objected strongly to the St Peter & St Paul in Plough Road application when it came in about 18mths ago, particularly to the demolition of the listed hall and the vicarage (not listed). They also objected to the cramming/height of the new flats and the fact that any social housing was to be separated from private by separate stairways in one block. This last is a requirement by housing associations who manage social housing. It defeats the aim of social inclusion of all communities. Needless to say it got permission. The new application 2013/2964 is to get approval for the recording (visually and written) of the listed hall that is a requirement when a listed building is demolished. The comparison of the treatment for those two churches is a superb example of the divide between the two areas of Clapham Junction: a modern one on the Grant Road side and a more classical, Victorian style, on St John’s Hill side. With the station at its heart, operating as a bridge between both sides, any transformation of Clapham Junction station should consider this aspect. 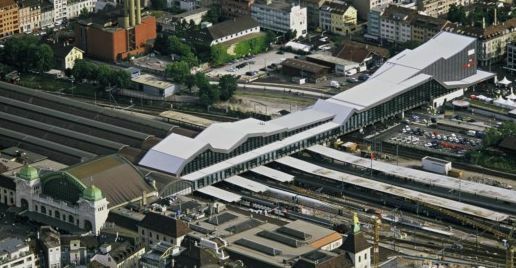 A good example with a station redevelopment in a layout very similar to Clapham Junction is Basel station in Switzerland.